Matrimonial software covers all the exceptional requires. It covers all the basic information required such as height, weight, caste, family and community, etc. 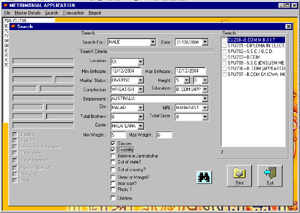 There is a feature to generate a report of the searched applicants, which could be printed. Their main function is to allow individuals or their parents to create a free profile for the intended groom or bride, and wait for prospective responses. The interesting thing about this whole process, how the Indian youth of today are trying to satisfy their own modern views of dating and at the same time keep their traditionally minded parents at bay as well as pacified. So, we decided to launch our own matrimonial site. We give option to search by community, region, and special cases. The important feature is that it facilitates the user to keep record of their transactions. It holds the record of the time and the date of the transaction made. The Software relieves browsing the huge entrant database, and quickly sorts the requisite details of the search done, and is thus very interactive. We give option to search by community, region, and special cases. It is expected of every member giving his / her matrimonial profile to disclose all material facts necessary for marital relations whether asked for. You can even upload / add your photograph to your profile. You can bookmark the profiles that you like as �Favorites� to view later. Registration and profile creation on matrimonial software can be completed in less than 10 Minutes. You can even change your password easily whenever you required by click �change your password�. You can add more information about yourself and your family. You can even see list of members who contacted you. The entire compulsory field i.e. only marked with * columns have to be filled in order to complete the registration. The information you provide about yourself the more likely you are to be contacted by other member. You can even easily edit your profile. You can change any information in your profile except your gender.